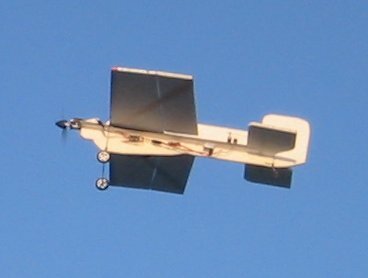 "3D" is the currently popular term for aerobatics in a very small space: hovering an airplane by hanging off the prop, doing torque maneuvers such as lomçevaks and waterfalls, and generally flying in ways which rely on engine torque as much as (or more than) wing lift. 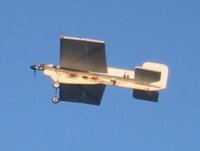 Dave designed and built a small (24" wingspan) 3D aerobat out of expanded polypropylene (EPP) packing foam, and he's been doing crazy aerobatics in the street in front of the house. 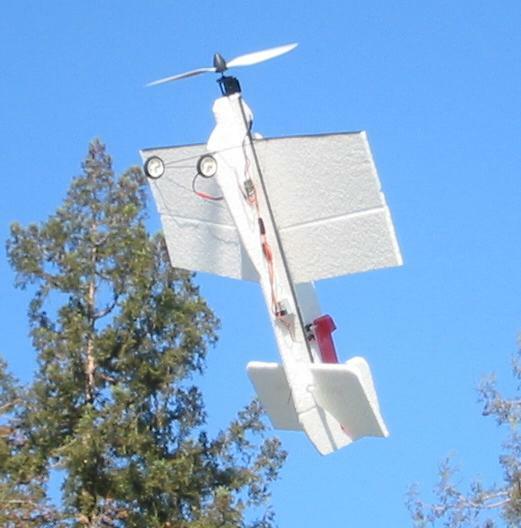 Because EPP is fairly rugged, the plane is relatively resistant to damage; and because it has huge control surfaces and is fairly small and lightweight, it can do wild maneuvers in a small space. The neighbor's dogs don't like the sound of the Feigao motor, and start barking when they hear it. That brings the neighbors out to watch; occasionally we get a big audience, and they applaud when the plane lands. Since it has wheels, it can fly off an asphalt surface without having to worry about catching it, and it can taxi around (most of our planes don't have wheels and need to land on grass or other smooth surfaces). Cool! Of course, I had to have one too. We got the sheets of 7mm EPP foam from Slowfly. 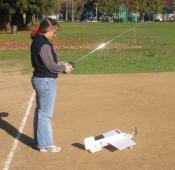 (Don't take that 7mm as gospel; actual thickness varies considerably.) 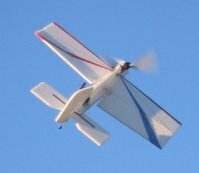 Design was somewhat similar to my Edge in basic size and wing conformation, but with much bigger ailerons (the Edge is a wonderful aerobat but doesn't have quite enough control surface for 3-D maneuvers), a full-flying elevator, a crossed fuselage (both horizontal and vertical pieces, as pioneered in the famous Shock Flyer series), and wheels (with carbon fiber gear). Most of the stiffening comes from thin carbon fiber strips along the edges of the foam, not from the usual CF rods embedded in the foam. I used "canopy glue" (a lightweight and somewhat flexible white glue) for most joints; it's one of the few glues which will work on EPP. Dave is gradually building a construction page. Since EPP is like Teflon and nothing sticks to it -- no stickers, and paint doesn't work well either -- the best way to decorate is with magic markers. I put color on the top side, none on the bottom side, so I can judge the plane's orientation when it comes out of a wild maneuver. Unfortunately, the EPP is a little transparent, so when the sun shines through it, you can still see some color underneath; but it's still pretty easy to tell which side is up, as you can see from these shots of Flipper's underbelly. Final weight is 5.3 oz without battery; a 730 mAh li-po battery takes it up to 7 oz. The power plant is a Feigao brushless motor in a GWS IPS-B gearbox. 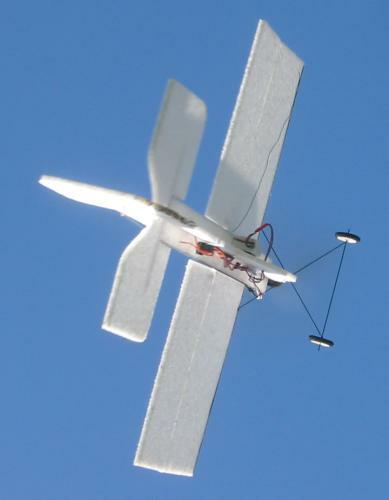 Dave is using an IPS-C gearbox, which gives slightly better pull at slower speeds, but requires a larger prop and is a bit more difficult to hover due to the increased torque effect. It's a great 3-D trainer! It doesn't fly level very well at all -- it's not a good general-purpose aerobatic plane like the seemingly similar Edge -- but it's excellent at wild tight loops, hovering, extreme slow flying and harrier landings. It has a steerable tailwheel, so it taxis, takes off, and lands nicely, which is fun since most of my planes don't have landing gear. 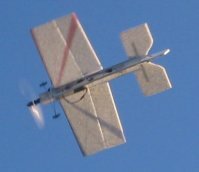 Despite the floppiness of EPP, the carbon fiber keeps it stiff enough that it's very responsive in the air, even if has too much drag to fly like a normal plane. Recovery from near-crashes is very quick, which is helpful for someone like me who's just learning 3-D flying. Dave's EPP foamie is named "Fifi" because the swirly EPP makes the plane look like a poodle. Mine is named Flipper, because the front of the fuselage came out looking a bit like a dolphin's melon. And it flips around pretty nicely in the air! Notice the red bit in front of the tail in the photo at left. That's a piece of Zagi tape I stuck to the wing to on the first flight to try to decorate the plane and make it easier to tell top from bottom. Remember how I mentioned that nothing sticks to EPP? The tape came unstuck as soon as the plane hit the air, got blown back and ended up stuck to the rudder pushrod. Whoops!